Now a group led by scientists at the Department of Energy's SLAC National Accelerator Laboratory, the National Institute of Standards and Technology (NIST) and Northwestern University has reported a shortcut for discovering and improving metallic glass—and, by extension, other elusive materials—at a fraction of the time and cost. 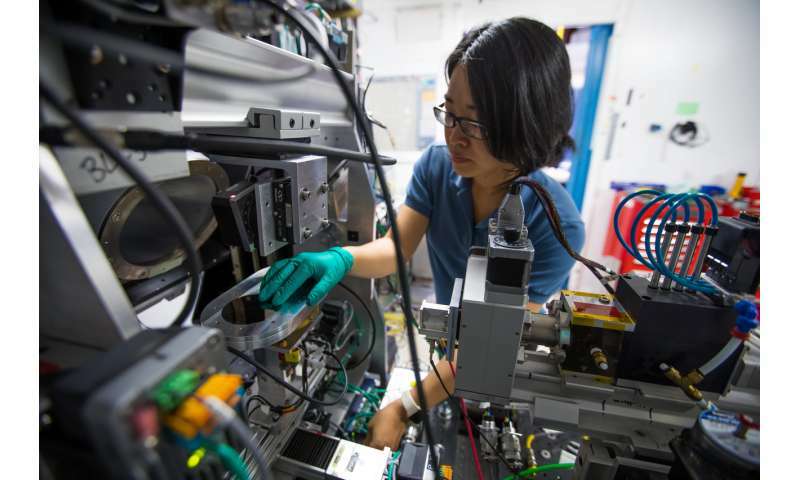 The research group took advantage of a system at SLAC's Stanford Synchrotron Radiation Lightsource (SSRL) that combines machine learning—a form of artificial intelligence where computer algorithms glean knowledge from enormous amounts of data—with experiments that quickly make and screen hundreds of sample materials at a time. 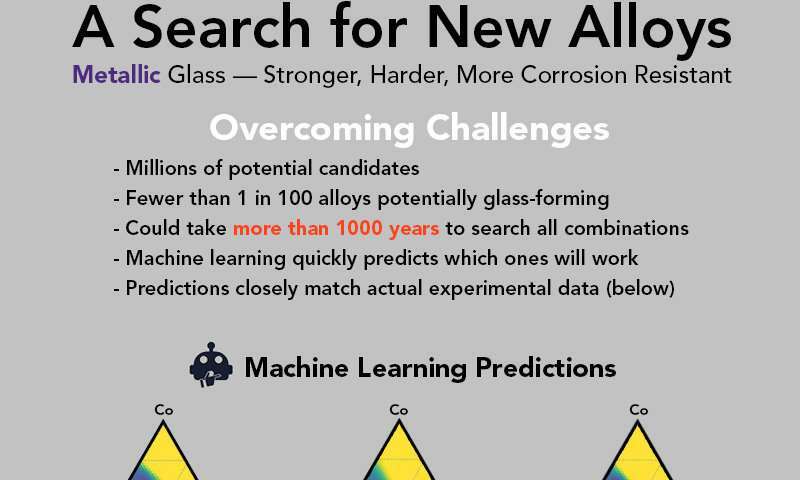 This allowed the team to discover three new blends of ingredients that form metallic glass, and to do this 200 times faster than it could be done before, they reported today in Science Advances. The ultimate goal, he said, is to get to the point where a scientist could scan hundreds of sample materials, get almost immediate feedback from machine learning models and have another set of samples ready to test the next day—or even within the hour. so now we can safely transport the whales to the future! Maybe they're going about this the wrong way. Instead of trying to mix the unmixable (at the molecular level anyway) why not try mixing long graphene fibers into metals to increase tensile strength? Kind of like rebar for metal. As for new bearing materials, things like that, they'd be better-off stick to research on ceramics. I'm sure they'll get right on that, Thorium Boy. Congrats! This research should be front page news. Hoping this goes a long way in debunking the artificial intelligence scare stories. A lot of things get called artificial intelligence that simply aren't. In this case, the main contribution was the high-throughput experimental system coupled to existing theory, where machine learning is used to bridge the gap between what the theory predicts and what the experiments show. To make a complicated matter simple, you can think of it like making a computer align an aerial photo of a place onto an inaccurate paper map of the same area by measuring correlations to get a best match. Machine learning methods are statistical methods, closely related to mathematical optimization. It's an offshoot of AI research, where instead of trying to create something intelligent, the aim is to create something useful. The problem is that when it does do something useful, the press immediately calls it "intelligent". The analogy is, a secret agent got you a photo of a treasure map that shows the locations of hidden money caches spread all over the country, but the photograph is all sorts of distorted and you can't make very accurate measurements from it. So you send out people to the locations the map shows, poking around for the treasure - and few come back with money and others don't because the information was just too inaccurate and they missed it. It's going to take ages to find it all. So what you then do, you send many surveyors out there to measure the major known locations on your map to know exactly where they are, and once they come back with the information you use the data to deform the picture of the map to match the real world. A computer algorithm does this for you, and then you have a new map where all the little X marks are shifted closer to where they would actually be in nature, so you can make exact measurements and tell your people where to dig.